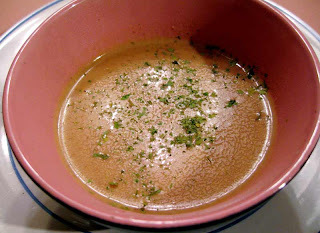 This weekend I made a soup recipe: Pinto Bean and Roasted Garlic Soup. I backed off from my Bean Challenge "beans as a main dish" declaration and decided to make a bean soup this week. I thought this would be a good way to continue finding interesting ways to incorporate beans into our family's diet. Thanks to What's Cooking for this delicious recipe! This soup was absolutely divine. If you haven't tried roasting garlic, it's very easy. 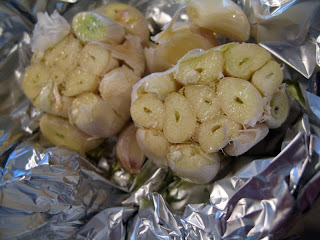 Follow the Roasted Garlic Recipe from Simply Recipes. Here's a photo of the final product. My photo doesn't do it justice. If you want to see a much prettier picture, go to What's Cooking. A few modifications: I didn't have onions or avocado due to a grocery order mishap (I ordered delivery for the wrong day!) I topped my soup with some dried parsley (compliments of this past season's garden). Lucky for me, I saved the broth from my latest bean batch (see my How to Cook Beans video). This soup tasted great! This bean soup was creamy, satisfying - sooo good. How did the kids gauge it? 4 year old - "This is the best soup ever!" I'm guessing this bold declaration was because he helped me blend it. Then he mostly didn't eat it - lots of coaxing did the trick for more spoonfuls. 6 year old - "This tastes terrible! Why did you have to make soup?" I told her she had to eat 6 spoonfuls. Husband was at work, so he'll have left-overs. We talked about the soup on the phone. Someday they'll appreciate their mother's cooking, I said. Oh it does look great! I am so glad you liked it, and you are right, your kids will appreciate your cooking someday. I do appreciate my mom's now, after so many years. Hehe.